Veteran NBC anchorman Chet Huntley visits Channel 2. Forrest Brokaw is at his left, George Martin at his right. C. Forrest Brokaw, Jr. was born in Shawnee, Oklahoma on September 5, 1928. He began working, at no pay, for KGFF in Shawnee at age 14, finally getting on the payroll when he reached 16. He was a writer/announcer for Armed Forces Radio/Television Service in Japan in 1946-47 as a member of the U. S. Army. Brokaw received an Associate degree in business/journalism from Woodbury University, Los Angeles in 1949. 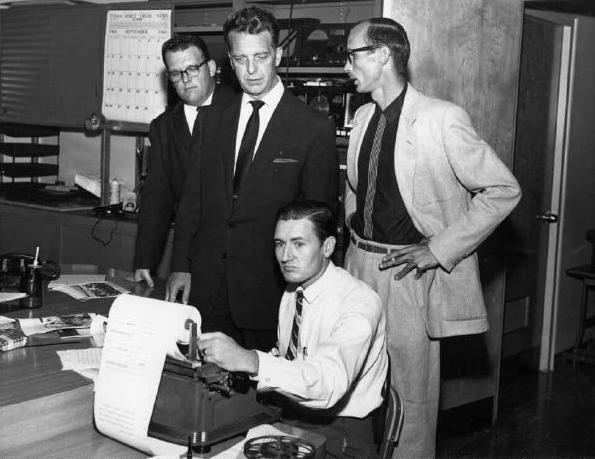 He served as News Director for KVOO Radio and Television from 1951-1961; News Director for KELi radio from 1961-1972; and general manager of KIXZ radio in Amarillo, 1972-1974. He also has been a city hall reporter for the Tulsa Tribune, and manager of radio station KUSH in Cushing. He participated in every Tulsa Press Club Gridiron show, except one, from 1951 to 1991. He served as President of the Tulsa Press Club in 1972. Brokaw also is a former nominee for Tulsa Police and Fire Commissioner. He won the primary election in 1968 by a large majority over the incumbent and five other candidates, though he did not prevail in the general election. He ran again in 1970. During his news career he interviewed Presidents Truman, Eisenhower, Nixon, Ford, Kennedy and Johnson, foreign leaders including Emperor Haile Selassie of Ethiopia, 6 of the original 7 Mercury astronauts, and more than a score of movie stars and authors. After interviewing author/poet Ogden Nash in 1953, he did his radio report entirely in the Ogden Nash rhyming style. He produced and narrated the nation's first television series on the space race in 1959 ("Countdown to Space") right after Russia put Sputnik into orbit. In 1979, he was loaned by Sun to handle national promotion for the PBS program "Over Easy" (starring another former Tulsa newsman, Jim Hartz) in San Francisco, raising the viewership of the program nationally to a virtual tie for first place among PBS programs. He is now a Tulsa area PR consultant. He retired from Sun in 1990. Brokaw is listed in Who's Who in America. Long active in community affairs, he served as a member of the Board of Downtown Tulsa Unlimited, Citizens Crime Commission, National Conference of Christians and Jews (Tulsa Chapter), and the Target Area Action Group (TAAG-a citizens/government urban renewal agency during the 1960's-1970's). He also is a member of the Carson-Wilson-Rigney-Forrester post of the American Legion. He and his family reside in Tulsa: wife JoNell (Foster) Brokaw; son C. Forrest Brokaw, III; daughters Nancy Beth Jernigan and Lt. L. Susan Waldron, U. S. Navy (retired).